Sorry I missed posting yesterday but it's been kind of busy with me doing a mostly Handmade Christmas this time of year. I got lost in doing some things then it go too late to post. I do require sleep for some reason. Here is my 3rd tag to share with you. As I see I only have a few comments from Tag #2, don't forget if you comment each time I post a new tag you have a better chance to win a tag of your choice but you must post as often as you can. Perhaps you may not be interested either and that is ok too. Just thought it would be a nice little giveaway as I am feeling like giving back and " tis the season to be jolly" I say. This tag was distressed using Peeled Paint. After it was dry I inked the edges again with the same ink. I tore some music page and inked it as well. 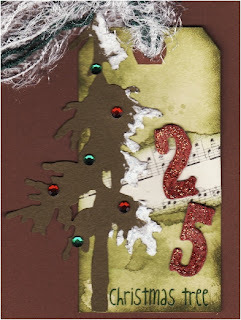 I then used this wonderful green cardstock in my stash and cut it out on the CB using Tim Holtz Alterations die. I added some textured snow that had glitter in it and just put snow on the one side of the tree and then added some green and red gems. The numbers are Grunge board numbers from a Tim Holtz grungeboard pack, inked in Fired Brick then I added some Diamond Stickles. I can't remember the company name of the Christmas Tree stamp but again from my stash of many stamp collections that seems to be growing. And that is it, a simple yet fun tag. If you would like to show me any of your Christmas tags I would love to see them. Just put a link in your comment or email me with Christmas tag in the subject line. Oh and for a great little nifty gift idea to tuck away a few little candies go to my friend's blog, Jenxo in Australia and check these out. I just had to make some they are a lot of fun and a great way to use up scraps and you can make them to hang on a tree. Yay! I just bought the tree die the other day - I just knew it would make a great feature on these tags! Very nice tag...love the red, glittery numbers that stand out too! Thanks! thanks for the plug les !